In Section 1.3.4, the rules state that the line will be 10cm away from any edge of the arena. My question is: What is the minimum distance each line/gap will be from a different line/gap on an adjacent(directly to the left/right) tile of the course? This came to mind when thinking of gap, as a common way to navigate the gap is through a zigzag motion. So when the robot is zigzagging, it may come into contact with an adjacent line on a different section of the course, pulling it off of the line it should be navigating. According to the rules the minimum distance is 10 cm (to any edge of the field, not to other lines). It is up to the field designer to make the layout of the line feasible. We are thinking of writing guidelines for the designer to avoid such situations that you are thinking about. I would recommend to not have closer to 10 cm to any other line as well, and count the gap as a "imaginary line", i.e.not closer than 10 cm between a line and a gap. 1) distance of another line away from an obstacle. It will be great this can be mentioned in the rule. The distance has to be reasonable; anything less 10cm is quite difficult for any primary league kids. If a minimum is stated in the rule, the host will not make the mistake on putting anything too close. 3) distance of an obstacle away from a ramp. I will reply as TC of 2017. We will not make promises about detailed numbers. It may be thought by the 2018 TC. If they think it is unnecessary they will not think about it. I think about routes to avoid obstacles as follows. 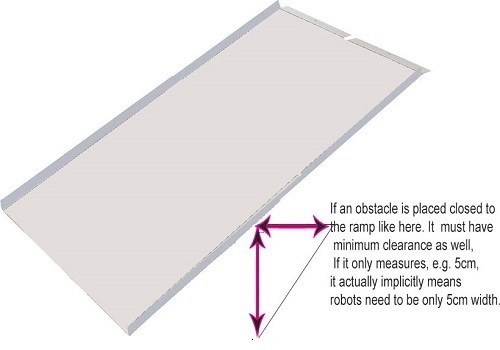 Place obstacles on either the right side or the left side where there is enough space for the robot to pass. The robot must return to a black line by the next tile of the obstructing tile. So it would be better not to place point events like Gap and Bamp on the next tile of the obstacle. The referee can easily judge the success of obstacle avoidance. It is "If it is possible" to the last. It is not "absolute".